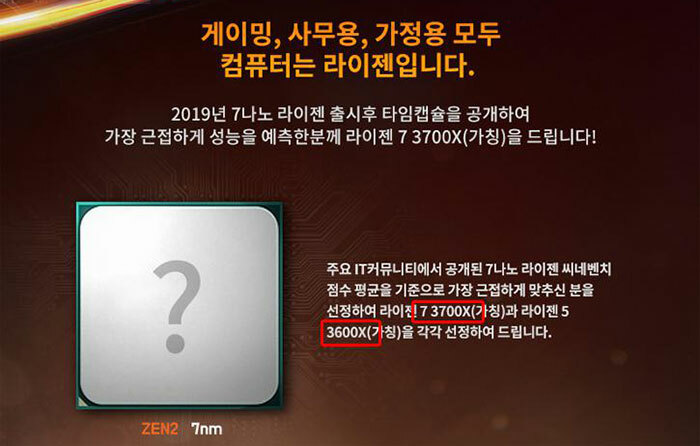 A South Korean CPU sales agency has opened up a competition which makes reference to next generation (Zen 2) AMD Ryzen processors. According to the VideoCardz report on the PR stunt (via Korea's HardwareBattle), the agency behind the competition is one hired by AMD to create local events and contests. The contest requires participants to make their best guess at prospective Cinebench scores for the AMD Ryzen 7 3700X and Ryzen 5 3600X CPUs. In brackets, next to those chip names in the Korean competition text, is written "tentative name," says Google Translate. You are expected to put forward your best guess at the test result for both single- and multi-core benchmark runs for either processor. While the competition closes on 14th December 2018, don't expect AMD to launch its Ryzen 3000 series so soon… Winners will have to wait until the new CPUs are launched before they get a chance to win, but no date is hinted at. Most tech commentators reckon we will be waiting until Computex 2019 for the next generation of AMD Ryzen CPUs to launch for consumers. The recent Gigabyte slides leak helps provide confidence with regard to this timescale. According to a ChipHell forum post AMD's upcoming Navi 10 GPUs will launch in mid-2019 and be competitive with Nvidia's GeForce RTX 2080. This is similar to an assertion of AMD CEO Lisa Su at the 22nd Annual Credit Suisse Technology, Media & Telecom Conference, so isn't a big revelation. Elsewhere in the ChipHell post it is suggested that Navi 10 hardware come with a "very attractive" price and its power consumption will be a "surprise". We hope that's a good surprise given that it is to be manufactured on TSMC's low power 7nm process. The last HEXUS report featuring the Navi GPU was back in October, when sources indicated that early test versions of graphics cards based upon the chip were performing "better than expected". Does Hexus not like AdoredTV? They know what anyone else don't or they are giving their opinion? Obviously i can't speak for Hexus but personally a YouTuber's sensationalist videos don't carry much credibility in my books. Youtubers, news sites, what's the difference these days? Jim does seem to have a relatively good track record for leaks. But because it's not verified, he clearly states to take it with salt. I can't talk on behalf of the editorial team here at HEXUS but as someone that's been following tech for a very long time I can give my input. Adored is 100% biased towards AMD and it's very well known he doesn't like Intel or nvidia which unfortunately makes him a very hard source to use.